Shelby Walker has a knack for swaddling an infant so that it sleeps safely on its back. Now expecting her fifth child, Walker shared her technique with some 300 fellow attendees during an Oct. 13 community baby shower at St. Raymond of Penafort Parish in Philadelphia. Sponsored by archdiocesan Catholic Social Services (CSS), the three-hour event featured baby care demonstrations, such as the one in which Walker participated, along with raffles, prizes and free food. An array of tables displayed information on resources offered by CSS and its partners, while face painting and a moon bounce rounded out the family fun. Attendees even received on-the-spot intercession, thanks to a “prayer tent” staffed by Deacon Bill Bradley and members of the parish’s evangelization team. “We even give you a little sticker that says ‘I’m prayed up,’” said Deacon Bradley. 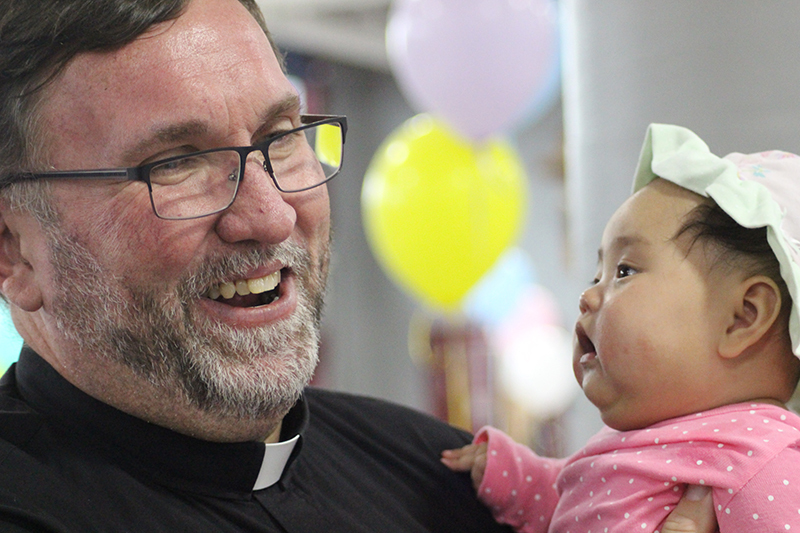 St. Raymond’s pastor, Father Chris Walsh, said that the prayer tent — and hosting the baby shower as a whole — was the parish’s way of partnering with CSS to address a range of needs experienced by area families. 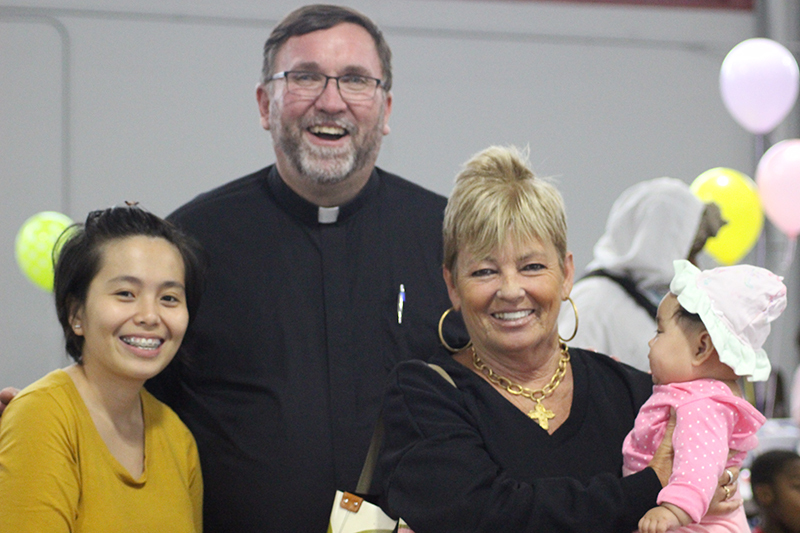 The Oct. 13 baby shower was the second such collaboration between CSS and an area parish. In July 2018, the agency’s Casa del Carmen family service center sponsored a similar gathering at St. William Parish in Philadelphia. 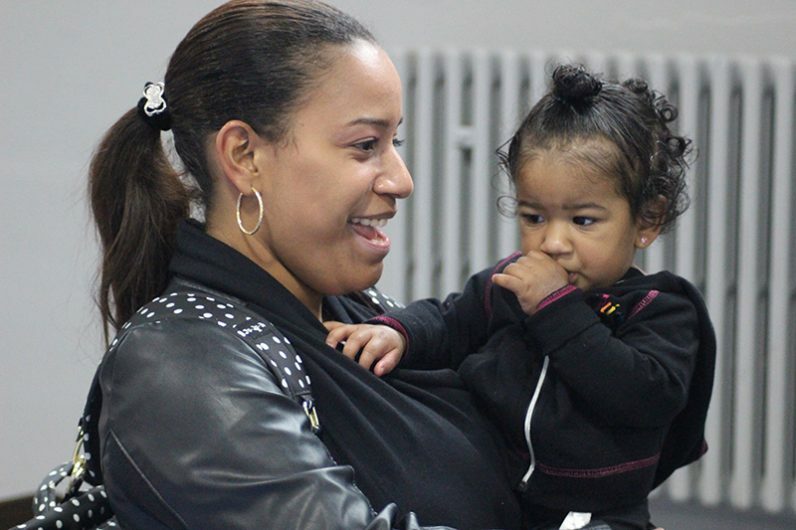 Last year, CSS provided assistance to more than 5,000 expectant mothers in the Philadelphia area. Fredaswinda Rodriguez, a parent educator from Casa del Carmen, was on hand at the Oct. 13 event to deliver baby care advice in both English and Spanish. She noted that while all expectant mothers benefit from instruction in baby care techniques and social development stages, those who are also immigrants face even greater challenges. Rodriguez was joined at the Oct. 13 shower by 25 CSS employees, who donated their time to staff the event. The event also enabled current CSS partners, such as Einstein Healthcare, to connect with local families. “Organizations like CSS have the people, and working with CSS allows us to reach those people where they are with our services,” said Anjelica Sanders, a nutrition educator with Einstein. Sanders and her colleague Fred Seymour regularly visit CSS family service centers in Norristown and North Philadelphia — at Casa del Carmen — providing strategies for improving family nutrition even if money is tight. During the Oct. 13 event, they provided samples of healthy food to whet attendees’ appetites for nourishing and affordable cuisine.